If you would prefer to text me you can get me on 07982319960. Please let me know how many adults and children will be staying in the caravan? We only do Saturday to Saturday bookings or Monday to Friday if available. Sorry No Friday to Monday bookings. Please note entertainment passes are NOT INCLUDED with your booking but can be bought from reception. 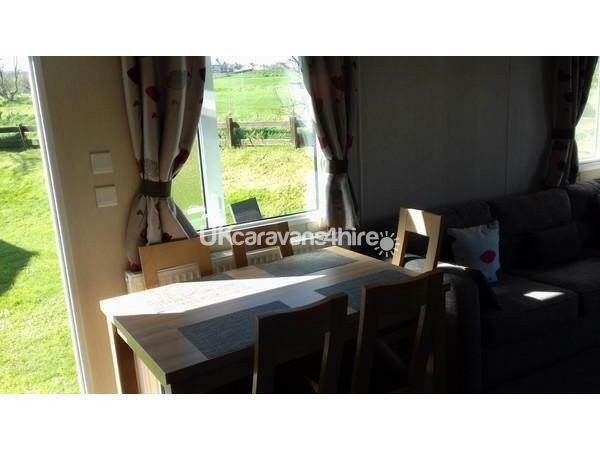 Our beautiful Swift Bordeaux Exclusive caravan has gas central heating throughout and is equipped with all your holidays needs and is situated on Berwick Holiday Caravan Park. 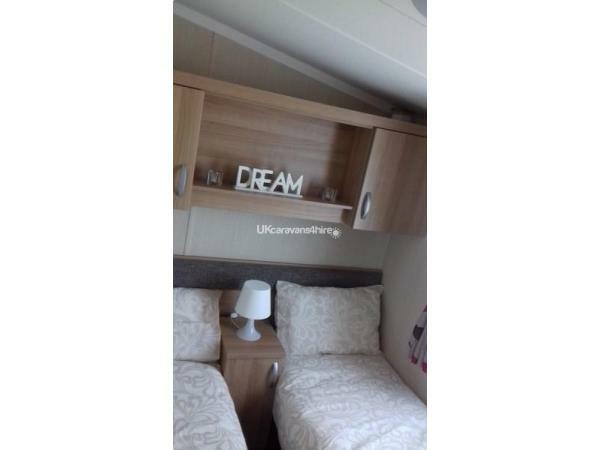 The caravan has three bedrooms with the master bedroom having its own en suite bathroom and dressing table with hair dryer and seating area. Plenty of storage throughout the van. The livingroom is an open plan living and dinning area with gas fire and free standing four and two seater suite with table and chairs seating up to six people. It has double patio doors that open up onto the decking which has seating and a table to enjoy your coffee in the morning looking out onto the 3rd hole of the Magdalene golf course and side sea views. Our caravan has two toilets and a power shower in the main family bathroom. The kitchen area has a gas cooker with a kettle,toaster,larder fridge/freezer, microwave, iron/ironing board all cooking utensils, dish towels,. It has its own tarred private parking for 2 cars. A newly refurbished *Show Bar *Briggs Of Tweed restaurant, *Indoor and outdoor swimming pool, *Football muga pitch, *Amusement Arcade,Laundrette, Bowling Green, Golf Course, Mini Mart, Takeaway Fish and Chip shop. There is always something to do at Berwick holiday park from entertaining the kids at the kids club to eating in the restaurents. This is a 5* Haven Park Site with lots to offer any family holiday. Local Attractions: Magdalene 18 Hole Golf Course, Berwick Bowling Club,Night Clubs, Pubs and Restaurants.Kidsplay park.Train Station that is a short walk to the caravan. No Friday to Monday hires sorry. Our Caravan is A SMOKE AND ANIMAL FREE ZONE because of SERIOUS ALLERGIES to a family member. So we PLEASE ask that you ABIDE by these conditions or you would be ASKED TO LEAVE THE CARAVAN and your good housekeeping bond would be WITHDRAWN and NOT refunded so that the caravan can have a deep clean. This is a £100 deposit on top of your booking deposit to cover breakages and spillages or damages to the caravan during your stay. If the caravan is left clean and the way you entered it and free from breakages or damages or spillages when you leave you will recieve you £100 deposit back within 7 days after you leave. Entry to the caravan on day of arrival is 2pm and you must vacate the caravan by 10am day of departure. On day of arrival you will be met by myself to welcome you to our holiday home and show you how everything works. Kate on 07982319960 or by filling out the (submit enquiry) form as above and we can go from there. If your just browsing as many do, just simply write down my id number 4864 to come back to this advert at anytime. Sorry, but we are unable to accept liability for injury, loss or damage suffered by you or any member of your party during your stay. Additional Info: (Some facilities require passes*)A newly refurbished show bar for 2017, *Briggs Of Tweed restaurant, *Indoor and outdoor swimming pool, *Football muga pitch, Amusement Arcade,*Laundrette, Bowling Green, Golf Course, Mini Mart, Takeaway Fish and Chip shop. This caravan is fantastic, it really is a home from home. All the facilities in the caravan are very good quality and the heating is excellent, only needs to be on a short while to warm up (if needed), the shower is also very powerful. 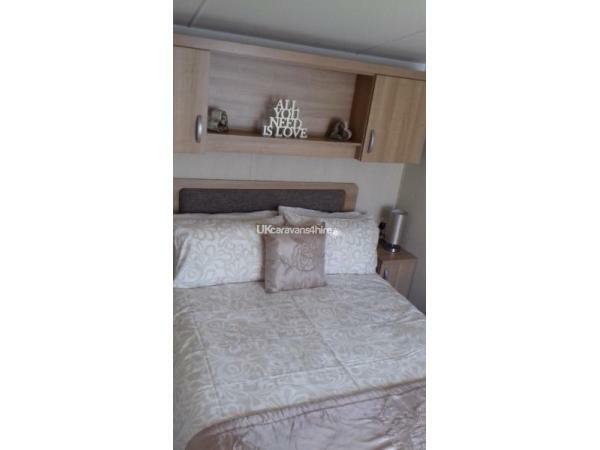 The caravan was extremely clean and by far the best caravan my family and I have stayed in, we would all recommend it. The owner of the caravan was very polite, welcoming and helpful and the welcome pack she left for us was very unexpected and a lovely surprise for us all, with something for everyone to enjoy. 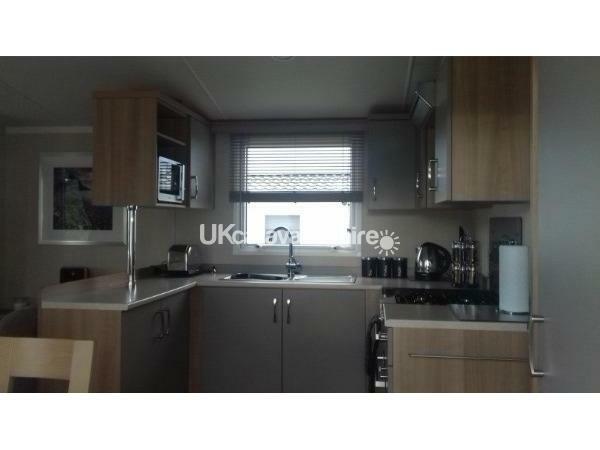 The caravan is situated in a great location on the site and only a short walk into town.